Getting adequate nutrition is crucial for proper physical and mental growth and development in your infant’s first year of life. Although general guidelines exist explaining what to feed a 7-month-old baby, you should treat each infant as an individual in terms of readiness to begin eating new foods. 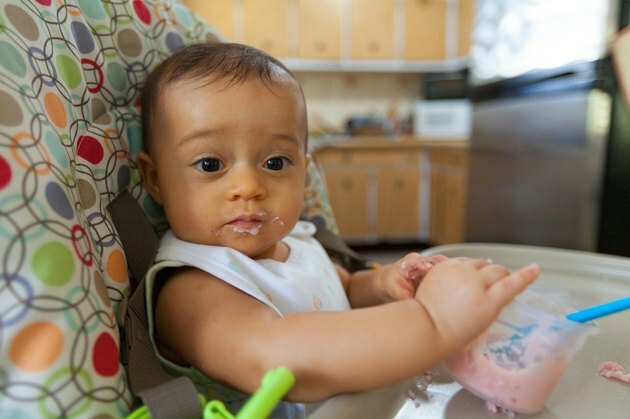 During your baby’s first six months of life, he can meet his nutritional needs from breast milk or infant formula -- but should be offered complementary foods after that, according to the Academy of Nutrition and Dietetics. The Institute of Medicine suggests 7-month-old infants need at least 95 grams of carbohydrates; 30 grams of total fat, including 500 milligrams of omega-3 fatty acids; and 11 grams of dietary protein each day. If your infant is breast-fed, ask your pediatrician if a vitamin D supplement is necessary. Seven-month-old babies still need breast milk or infant formula three to five times daily because it is nutrient-dense and high in dietary fat, including omega-3 fatty acids, notes MedlinePlus. The American Academy of Pediatrics suggests that a 6-month-old baby eat about 6 to 8 ounces of formula or breast milk per feeding, which is similar to the amount that a 7-month-old should be consuming, depending on how much other food he’s eating during the day. Most 7-month-old babies have already mastered eating iron-fortified rice, oatmeal or multigrain infant cereals mixed with breast milk or infant formula. After your 7-month-old consistently eats infant cereal two to three times a day, try adding pureed fruits and veggies to his diet. MedlinePlus suggests offering new fruits and veggies one at a time and waiting two to three days -- to check for possible allergies – before trying a new food. Offer fruits and veggies four times daily in portions of 2 to 3 tablespoons, MedlinePlus recommends. Many 7-month-old babies can also safely eat whole-milk baby yogurt. Some 7-month-old infants are ready to try soft finger foods. Examples of age-appropriate finger foods for them include soft cooked veggies, bananas, soft crackers, noodles and toast. Avoid possible choking hazards such as hard fruits and veggies, grapes, peanut butter, popcorn, seeds and nuts. If you’re unsure if your 7-month-old is ready for finger foods, seek advice from your infant’s pediatrician. American Academy of Pediatrics: How Often and How Much Should Your Baby Eat? What are the Best Foods to Feed a Toddler Who Is Underweight?